The First Val Girl Manual With a Speech Pathologist’s Emergency Techniques. This classic book written by Dr. Lillian Glass, showed Valley Girls of the 1980’s how to get rid of their Val Speak still applies today…. The First Val Girl Manual With a Speech Pathologist’s Emergency Techniques. OMG! 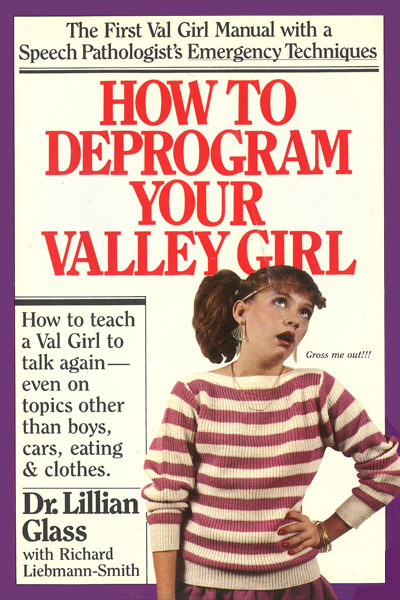 This classic book written by Dr. Lillian Glass, showed Valley Girls of the 1980’s how to get rid of their Val Speak still applies today. While humorous, as it deciphers teen slang, many of the speaking skill exercises such as Jawing, Sis Boom Glide, Nose, No No’s, From the Guts,and other easy to follow speech and voice exercises can help you sound great and speak like a pro. Dr. Glass has not only applied these exact techniques she describes in this easy to read book to her former Valley Girl clients, she has used them with A list celebrities, newscasters, singers, politicians, sports figures, and even with world leaders. The exercises in this book can give you the confidence to become the best speaker whether you are talking to one person or a room of thousands.